I was about to become a teenager; somehow I knew that my grandmother was going to give me that Spot-On Routemaster bus that I craved. “Don’t you think that you’re getting a bit too old for dinky toys now?” my mother had asked, but I didn’t respond, I had desired that expensive bus for some time and it was the only thing I really wanted from Gran for my birthday. On 22nd May 1962 there was the present from my grandmother; the right shaped box – inside, my dream, the Spot-On Routemaster. There was just one minor cloud on the horizon, my 16-year-old cousin was staying with her at the time and he teased me mercilessly about having what he thought was a rather juvenile toy for my 13th birthday “Has Mikey had a little busey for his birfday den?” he whined constantly in a childish tone. I tolerated this though as I had a present I really wanted and was silently delighted. I knew that I would not be able to tell my friends about my bus either, as they too would have taken great delight in making me a spectacle of ridicule. 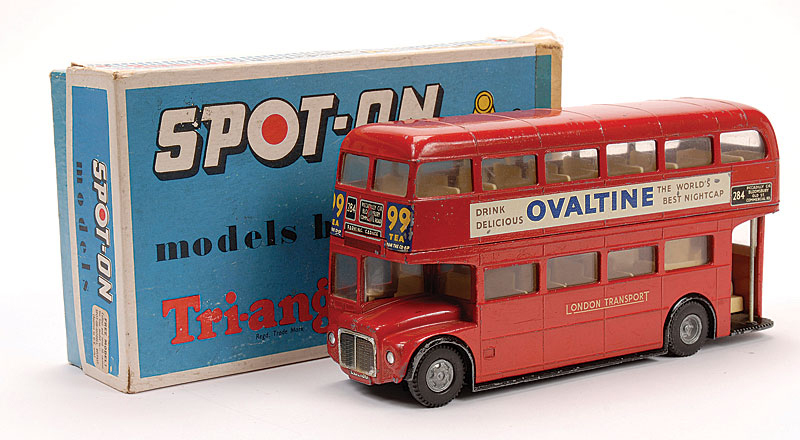 The Spot-On Routemaster bus, at a scale of 1/42, was huge by dinky toy standards at about 9 inches long x 6 inches high, completely out of scale with all my other toys. I think I recall it cost 15s.0d in 1962, certainly a lot of money when about £15 was the average weekly wage. Sadly I no longer have it, in the 1970s I passed it on to another young lad who was interested in London buses and he had the same enjoyment from it that I did. As you’ve probably guessed by now, it’s my birthday today but probably won’t be looking to receive a replacement Spot-On Routemaster; an excellent immaculate boxed example was sold recently at over £1500! The only Routemaster we had in our house was the one for the Queen’s Silver Jubilee. My son was born that year. It spent last year in amongst a display of Royal memorabilia at our museum. I paidd a few pence for a cheapo red one (no maker’s name, just says Made in China) to occupy the silver one’s home spot.. Sadly mine was very battered and minus a wheel when I passed it on so would never have made this sort of money. The lad who had it after me really loved it despite its missing wheel – he no longer has it either! Good story. My grandad was a bus conductor on a forecaster! Route master!where did that spell check come from? I was just looking up forecaster, had no idea what you were on about – yes, spellcheckers are nuts, mine keeps changing the name of my home town of Bridgend to brigand – perhaps it’s trying to tell me something! I have one of these since a child ( 60 now ) Unfortunately it is a bit scratched but in one piece. And not many command silly prices like the one in my story – they were meant to be played with and mine was well used!